Who doesn’t need a little more storage space? 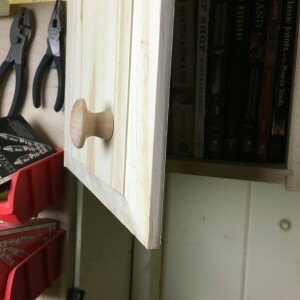 Whether it’s in the woodshop like me, or anywhere else throughout your living space, small cabinets help to tuck away the clutter and keep things organized. 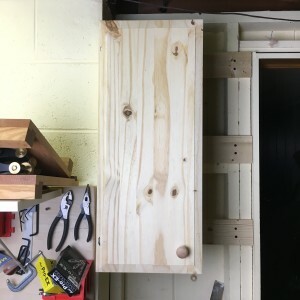 In this episode we’re making a simple, small cabinet from supplies you can easily pick up at just about any home center. For this one I purchased a few “handi-panels” which are pre-glued and dimensioned boards that eliminate most of the milling we’d have to perform to get them ready for cutting and assembling. I also purchased some adjustable “euro-style” hinges and a simple wooden knob for the door. For joinery, it’s all about the “blind-rabbet” joint in the corners to assemble the box, but something as simple as pocket-hole joinery or even tongue and groove would work fine too. Of course you could take a step further and use dovetail joinery or such to spruce it up even more. The only real “decorative” feature on this simple cabinet is the raised panel on the door. Originally I planned to leave it a flat panel, but then I wouldn’t have had a chance to free-hand the extra wide chamfer all around the edge with my skew rabbet plane. Regardless of what you do with your small cabinet, this is a quick and easy project perfect for a single-day or leisurely weekend build. Nice simple piece for the workshop. My books could use a home like that. Think of the blow thru to the hinges as a contemporary design element. Just tell anyone (who hasn’t seen this video) that you planned it that way. I have been planning to slowly incorporate mixed materials into my projects…why not start now? Can’t find the cut list? I didn’t share one. I guess it’s on my to do list now. I seen where you said this is a very simple piece so I am assuming that video was it on how to or will more follow? That was the one and only for this build, I’m sure I could’ve gone on a little more, specifically into a finishing discussion but that’s a topic I try to avoid because there’s so many options. I see you use Kreg set up blocks, do you find them better then the brass bars to set up a blade or a fence? I won’t go so far as to say they’re better, but instead that they’re more versatile. The fact they can be used to straddle a blade or bit versus simply bumped up against it is a feature I really like about them. Cabinet looks great, I’m gonna have to watch the video this evening. What did you think about the quality of the Handi-Panels? 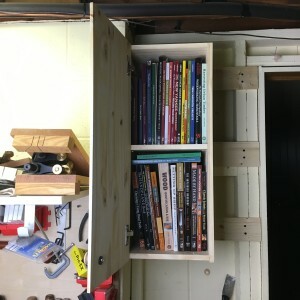 I am finishing up my workbench and would like to build a tool chest to put underneath it. I need 18″ width pieces 48″ long and would prefer wood to plywood and thought those might be a good choice (I’ll be painting it). Any comments on their quality – flatness, glue joints, knots, etc? I’d pick up stain grade even though they’re going to be painted. Most of the handipanels were pretty flat and the glue joints solid. Some of the knots and imperfections were very evident, but they did a good job minimizing anything that weakens the panels. The only issue that isn’t obvious is there’s some variation in the thicknesses down the length of the board, not significant but it was present. Also, as I learned the hard way, you might want to check the dimensions of the panel especially the widths. Probably not the most important part of this project, but how did you mount the cabinet to the wall? Did you put a cleat on the back, or just toenail through the sides?